We love having our garden filled with birds, thus we have put up a variety of bird feeders. We also make lots of water available for the birds. The result is a 2½ year old that can identify about 8 birds in the backyard. We recently had a guest that politely lectured us on how "un-cool" we were for creating an dependency for the birds on our seed; how the commercially available seed as like "junk food" -- and that when winter comes (we're in Minnesota) the birds might be less inclined to migrate in their search for food. I felt well chastised. Are there ways to attract birds into our garden naturally (e.g. certain plants/landscaping), and at the same time, also provide a source of food for them? 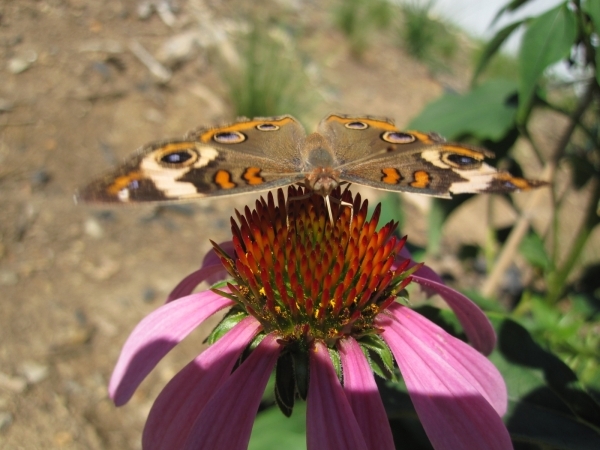 Look into native plants that are attractive to wildlife such as birds, butterflies, bees, etc. You can find more information at the Minnesota Native Plant Society website. 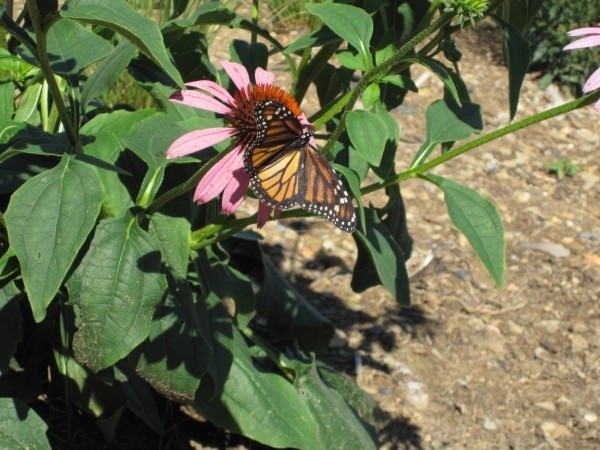 If you’d like to attract birds to your yard, plant some easy to grow, inexpensive annuals! Remember to plant the annuals densely, because birds feel more at home in thick growth. Just scratch the soil surface, scatter the seeds, and crumble handfuls of soil over them. Keep the seedbed moist until the seedlings are established and remember to mulch your annuals before they start to flower. Annuals: Bachelor's Button, Garden Balsam, Cosmos, etc. Flowers (hummingbirds): Bee Balm, Butterfly Weed, Cardinal Flower, etc. Berries: American Cranberry Bush, Arrowwood, Barberries, Black Currant, etc. Perennials: Coral Bells, Coneflowers, Coreopsis, etc. Vines: Sweet Autumn Clematis, American Bittersweet (plant a male and female plant for fruit set), Grapes, etc. Trees: Cornelian Cherry, White Fringe Tree, Hawthorn, etc. In addition, the trees provide all kinds of food for birds, from acorns to seed pods to berries, plus countless insects. Personally, I don't use annuals in my garden. Why? I'm cheap when it comes to plants (my wife is just as cheap). I'm lazy i.e. planting every year, looking after every year, tidying-up every year is too much of a hassle. I only use perennials in my garden and generally try to stick with Missouri natives, or plants that are known to do well in Missouri. Perennials (especially native plants) once established basically look after themselves, and generally speaking can be divided every few years i.e. free plants for your garden and friends. American Goldfinches (which I never saw in our garden the 4 previous years) visit daily to feed on the seeds of the Coneflowers. Hummingbirds come in regularly and feed on the 3 different varieties of Heliopsis, which I don't quite understand, seeing as the flowers (shape) aren't really suitable for them. In bstpierre's answer, he makes an excellent point about not using, or at least limiting the use of chemicals in your landscape. Taking a more organic approach will definitely make your garden a more natural, alive environment. Personally, I take the organic approach because I don't like using chemicals; plus I have two young children and I want them to enjoy the garden without worrying about them coming into contact with toxic substances. So yes, my garden isn't a perfectly "sterile" environment, it's alive will all kinds of things, both "good" and "bad". I just try to strike a happy balance and let things take care of themselves, and only step in if I really have to. Once established they pretty much look after themselves. They generally don't suffer from insect or disease problems. Can be divided every few years, yielding free plants. Add great Winter time interest into the garden. Seed-heads can be a food source for birds during the Autumn (Fall) and Winter. If you have a shady area in your garden, Hostas are a great plant for such areas, and when they flower, hummingbirds are attracted to those flowers. As you've already noted, having a constant source of water is beneficial and helps attract birds (and other wildlife) in. I'm not sure if mosquitoes are a problem where you are, but if they are, you will want to keep an eye on any standing water as such areas can become breeding grounds for them. I noticed in my native garden, which is at least a couple of years from fully establishing itself (i.e. plenty of bare spots on the ground), that the birds seemed to enjoy coming in and giving themselves a dust bath in the heat of summer. While I realise the following is UK based, I believe it contains good "general" information that anyone can incorporate into their garden, if they wish to encourage wildlife in. Listen to Gardeners’ Question Time podcast "2 Sep 11: Suffolk", start at 16mins:10secs in. Dawn Isaacs (garden writer and blogger) visits a new RSPB garden to discuss how to create a bird-friendly garden. Allow grass to grow a little taller. Plant Springtime bulbs in the lawn. Side note: IMHO putting out one or two strategically placed bird-feeders isn't the worst crime you can commit against nature, especially if they are only put out during the Winter months, when food is scarce for your non-migrating native birds. Credit goes to "Mancuniensis" for the additional "Side note" info above. Mike Perry's answer covers much of the food and water aspect. There's also the perspective of shelter. Depending on what kind of birds you want to attract, planting trees and landscaping in a way that provides small birds with protection from predators encourages them to stick around when they've discovered that your yard is a good source of food. A retaining wall behind our house is built out of loosely stacked boulders (i.e. lots of cracks). The wrens (my best guess at identification) seem to really like this for nesting. Similarly, if you want a variety of birds, you need to provide a variety of food sources and shelters. Just as you might have different kinds of bird feeder and seed mixes to accommodate different species, you should consider different habitat choices and preferred foods for the birds you are trying to attract. If you have a larger property with lots of trees, you don't necessarily want to cut down dead or dying trees. These "snags" are habitat for woodpeckers and make good perches for predatory birds to scan the landscape. We had a massive turkey vulture perched on a snag behind the house earlier this summer. It was an incredible thing to watch it land and take off again. I've seen hawks come and go too. Again if you have a larger yard, and live in an area where it wouldn't be politically incorrect to "let it go", you can plant (or let go) a section of your yard to "meadow". Part of our front lawn is heavily "infested" with daisies as weeds (purely volunteers, we didn't plant any seed there). Earlier this summer we decided to simply stop mowing since the daisies were coming up so thickly (along with some red clover). The birds seemed to like it some -- especially our guineas -- but I think we mowed it too soon after the flowers died back, and I'm not sure daisies really produce enough seed to be attractive to birds. If you wanted to try something similar, you could look for plant species that your local birds would like. In that same vein, we've got a flower garden that was started with weeds pulled out of roadside ditches. These native weeds look nice (we didn't pick the ugly ones), are known to be hardy to the area, are familiar to the birds in the area, and have grown enough in three or four years that we can hack them back with a spade to keep them in check. Since we harvest our own firewood, we often have piles of trimmed branches (that won't be burned) hanging around until we chip them. Lately we've had a little flock of small birds (wrens? I'm not great at identification) that loves to hid in amongst the branches. I think it helps to keep them safe from our cats -- it probably helps that the pile is out in the open so there's not much place for a cat to lurk. Lastly, if you really want to attract birds, plant some berries or fruit trees for yourself. In my experience, once you do this it's impossible to keep the birds away! Provide somewhere for them to nest. So far nesting boxes have not worked for me but a dense evergreen tree or two would provide a good habitat. I would also look at discouraging cats. It is really a matter of food and shelter. Fill your landscape with plants native to your area, provide bird houses or avoid destroying natural bird habitat, make sure that water is available, and avoid over-using pesticides. Lots of good answers about food and shelter (and also add water in drought conditions), but I should also add that you can try to keep predators out (another kind of shelter). In urban and suburban locations this typically means cats. The RSPB put the annual bird kill from domestic cats in the UK at 'several million'. Which IMHO is more significant than leaving food out at migration time! Keeping cats out will reduce the number of deaths, but there will be a greater effect by the lack of deterrent. Cats will deter birds. Birds are supposed to love the Illinois Everbearing Mulberry. Make sure you're ready to commit to having a large tree if you plant it, though. I mean, if you ever want to cut it down, make sure you can without risk of damaging a house or such. I noticed robins eating our blackberries, this year. I haven't particularly noticed any birds eating our black currants (although they might eat some of them). They seem to like cherries and sour cherries. I've heard they like dogwood fruit. Some birds like sunflower seeds (you can get a variety of sizes). You can always grow some seedy plants that birds like, such as millet. Birds like to nest in certain kinds of large trees. Some trees, they seem to leave alone, though. One thing you can do is have lots of leaves on the ground. Birds sometimes ferret through leaves to search for worms. I have a feeling birds like weed seeds, too. Make sure that places birds are to frequent are not accessible to cats. I noticed more birds in our pine tree after we removed several of the lower branches. If you want hummingbirds, you can plant lots of flowers (including roses). Or, you can always just move to Kentucky or southern Indiana. Birds are everywhere there. Just for fun, you could play some music outside. A certain bird (some kind of large jay, I think—the likes of which I had never seen before) came and looked rather curious when I was playing some classical music with the door open. Not the answer you're looking for? Browse other questions tagged trees plant-recommendations birds shrubs or ask your own question. How can we protect a fig tree's fruit from birds? Can I trim this shrub into a spiral shape? What birdseed can I use to attract native birds in Houston, TX, that won't attract squirrels? How do I get rid of mice without hurting the birds that might feed on them? How many trees are needed to attract birds as significant pests? How can I keep birds off my berries for cheap? How to get rid of mynah birds? How to attract white stork (Ciconia ciconia) to a garden?